Matt Eckler has stepped up to play in goal opposite Seamus Moody, so we have full lines of 13 skaters and two goalies for tonight. We’ll play shift on the fly like last week. Don’t forget the earlier start at 9:00 PM. This entry was posted in Roster and tagged 2014, December, Main Street Arena, Roster on December 29, 2014 by Sperry Hockey. We still have room on the roster for additional players, so please sign up online if you want to play. If it’s late, call David to confirm that there is still room, but odds are we can fit you in even if you just show up at the rink unannounced. We’re going to play shift on the fly tonight. Here are the rosters. Don’t forget the earlier start at 9:00 PM. This entry was posted in Roster and tagged 2014, Main Street Arena on December 22, 2014 by Sperry Hockey. Here is the roster for Thursday December 18 2014. We have a full roster and a few alternates. Remember, you can still signup online as an alternate! We take the ice at 9:30 PM and play for 60 minutes. This is our regular Sperry Marine Hockey Club slot at 9:30 PM every Thursday. This entry was posted in Roster and tagged 2014, December, Main Street Arena, Roster on December 16, 2014 by Sperry Hockey. 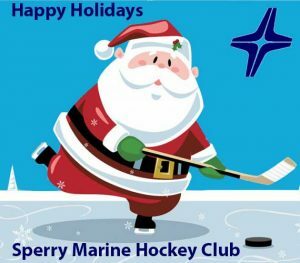 The Sperry hockey game on Thursday, December 18 is still on, but but the holiday hockey schedule does not include games on Christmas Day or New Years Day. So we will NOT be playing on Thursday, December 25 (Christmas Day), because the rink will be closed. Likewise, we will not be playing on Thursday, January 1 (New Years Day). 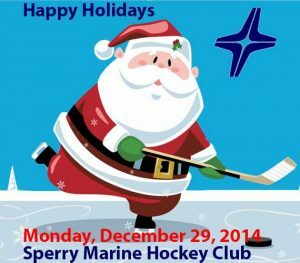 This entry was posted in Announcement, News and tagged 2014, December, Holiday on December 13, 2014 by Sperry Hockey. Here is the roster for Thursday December 11 2014. We have a full roster, plus one alternate. Remember, you can still signup online as an alternate! This entry was posted in Roster and tagged 2014, December, Main Street Arena, Roster on December 10, 2014 by Sperry Hockey.